Today has been a great day. I finalized details on the Year-End Celebration – which you should come to! It’ll be on Jan. 5th from 4-8PM at McClellan’s Retreat in Dupont. Come and meet many of the people who have been recipients of my letters as well as a few who even penned me a handwritten note as well. If that wasn’t enough – it gets better. If you make a tax-deductible donation to Street Sense, a nonprofit that is close to my heart, you’ll get some great drink specials and a special gift from me! Today’s recipient has played a key role in my Year of Letters. It’s Leo – my mail carrier. He is friendly and courteous and always delivers a smile when I see him. 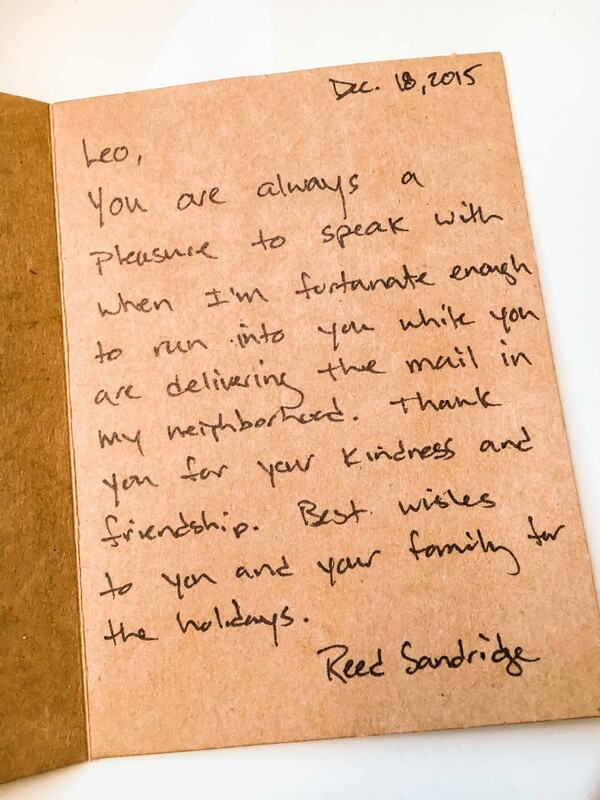 My neighbors and I are extremely fortunate to have Leo and I thought I would give him a small gift to show him my appreciation. I wrote him a check and tucked it in today’s handmade card. You are always a pleasure to when I am fortunate enough to run into you while you are delivering the mail in my neighborhood. Thank you for your kindness and friendship. Best wishes to you and your family for the holidays. P.S. You’ve been a critical part of my Year of Letters – making sure all my mail is picked up and delivered properly. You’re the best! 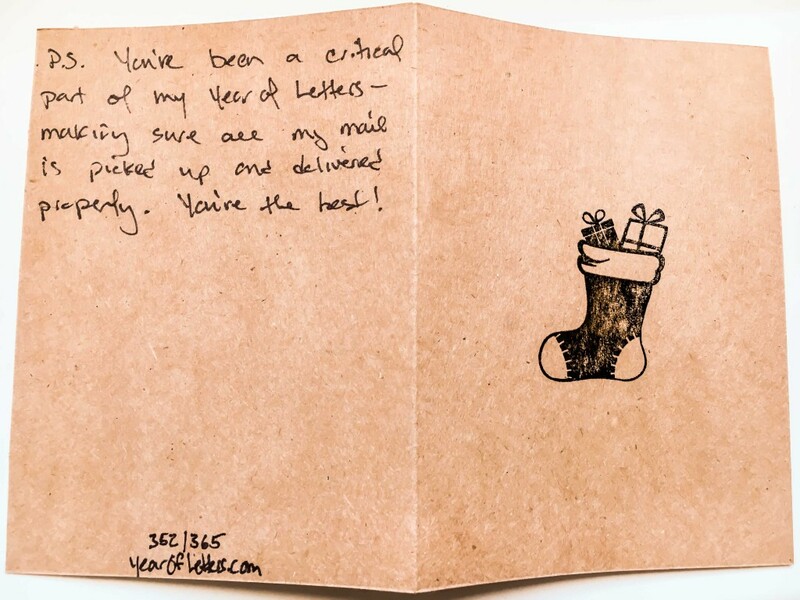 This entry was posted in Thank-yous and tagged embossed, handwritten letters, letter carriers, mail carriers, mail service, sharpie extra fine, USPS, Year of Letters, year-end celebration. Bookmark the permalink.